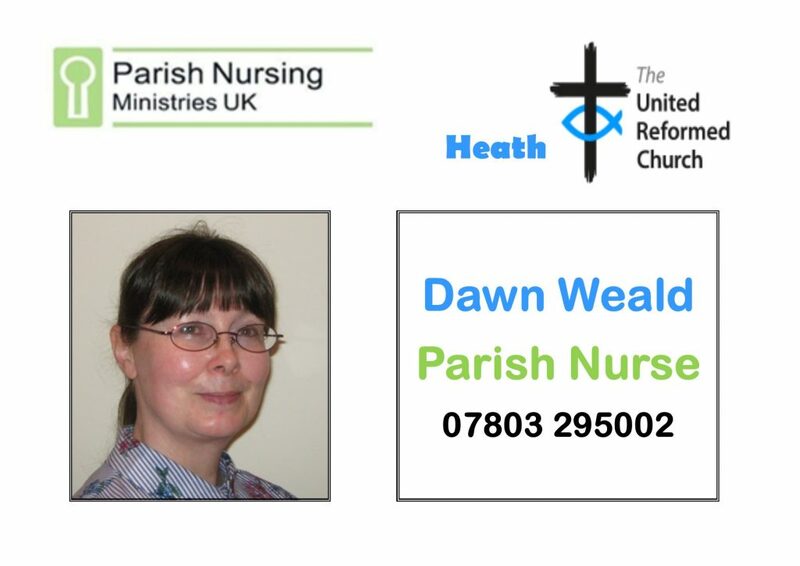 Dawn Weald is our part time Parish Nurse. What nursing care am I offering to provide? I am available to offer support with your health needs. This may be to talk through your health and wellbeing. It may be to support you in seeking the most appropriate care for your needs. I am also able to offer the opportunity to explore the spiritual aspects of your health care, if you wish me to, and to pray with you. I cannot offer any clinical treatments such as dressings or injections, but can support you in getting the care you need. If you have an acute illness please contact your GP or pharmacist. For non-life threatening emergencies ring NHS Direct on 111 and use 999 for life threatening emergencies only. My nursing qualifications are: Registered General Nurse and Registered Sick Children’s Nurse. I also hold a Post Graduate Certifcate in Healthcare Chaplaincy and trained as a Parish Nurse in 2016. My nursing experience includes a range of theatre, acute and chronic nursing of adults and children. I also have worked in child and family psychiatry, dermatology, healthcare chaplaincy and with a practice nurse in a GP surgery. I am registered with the Nursing and Midwifery Council and am a member of the RCN. I have a current Disclosure and Barring Service Check (DBS). What is Parish Nursing? Parish Nursing seeks to provide whole person healthcare through a local church community. Based on Christ’s teaching and ministry, Parish Nurses provide support for the physical, mental, social and spiritual health of individuals and aim to improve the lives of people in the UK by ministering health and wholeness. Registered nurses work from their churches offering individuals and communities personal health advice, advocacy support, health education, offer support groups, and helping people integrate their faith and their health. The Parish Nursing Service is available to people of all faiths and none. The Parish Nursing Service at Heath focusses particularly on older people. Parish Nurses are supported by a national charity, Parish Nursing Ministries UK. The organisation offers Parish Nurses support by providing local opportunities to meet, study days, and ensuring that professional frameworks are in place. All nurses are regulated by the Nursing and Midwifery Council and work under a Code of Practice. If you would like to know more about this then please ask your Parish Nurse. The details the Parish Nurse holds about your care will not be shared with anyone or used for any other purpose without your consent. You may ask for visits with/from the Parish Nurse to end at any time.